Whatever the style, bedrooms are spaces that celebrate privacy and serenity and express their owners’ taste, preference, and personality. When decorating any kind of bedroom, from a master one to a nursery, try to go beyond the basics and add eye-grabbing accents that will help create a space you simply love. Choose a style and hues that make you happy and go on beautifying the space to get the look you aim at. Mix and match area rugs, window treatment, wall coverings, bedding, and throw pillows to add pattern and texture. Incorporate statement furniture pieces is always a way to take any space to the next stage. Consider including art pieces, collections, and favorite mementos, they definitely are an option to personalize your bedroom. Usually, as they add color, scent, freshness, softness, and charm, flowers, potted or cut, are an easy, affordable way to embellish the space. As for kid and teen bedrooms, don’t try to create the bedroom of your dreams from the time you were a kid or a teenager. Instead, let your kids’ imagination go wild, encourage their creativity, and help them have their oasis, a functional yet magical space where to rest, play, and study. Being a strictly private space where people sleep and relax, bedrooms are synonymous with serenity, warmth, and comfort and their décor should create a sense of calmness. Although furnishings can vary a lot, depending mainly on the taste and social status of the owners, as well as on the traditions, there are some must-have décor items. Obviously, bedrooms can’t go without a comfy bed and extra seating, adequate storage, layered lighting, and quality bedding. Incorporate furniture pieces and furnishings that can help lend a complete look, such as nightstands, area rugs, window treatment, artwork, mirrors, favorite family photos, and some little luxuries. Focus on including décor elements that work well together to create a cozy, inviting space, which makes you feel relaxed and happy. Actually, any piece of décor can beautify and enliven the bedroom, from a canopy bed to a piece of mirror furniture to an eye-grabbing tapestry used as wall art to a luxury tray with an arrangement of scented candles to a vase of flowers. This space is all about warmth, elegance, luxury, sophistication, and romance. Definitely an exquisite master bedroom! Above, weathered furniture pieces add Shabby Chic charm to this appealing, cozy, filled with natural light farmhouse-style bedroom. Floral patterned duvet and chair upholstery, a floral-themed piece of wall art, and a beautiful bouquet add a distinctive feminine vibe. 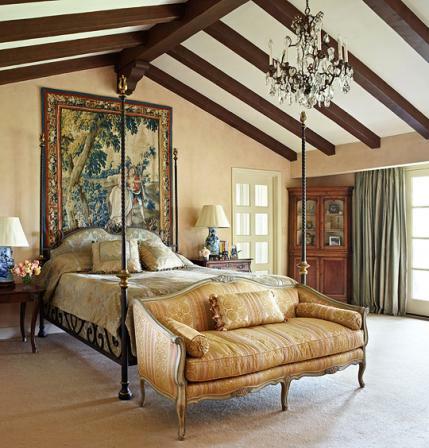 Shown above, a fascinating traditional bedroom in yellow. 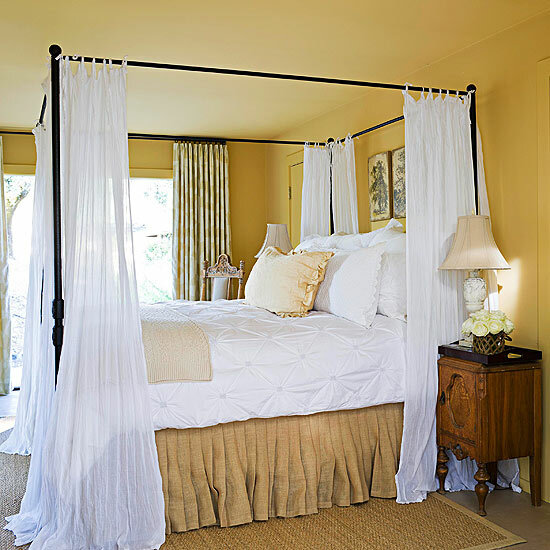 A skirted four-poster bed is complemented by sheer white curtains. 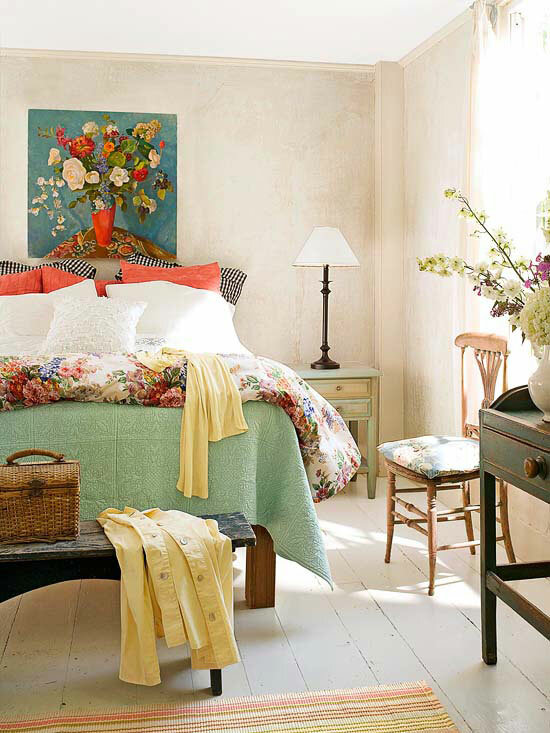 Wooden furniture pieces, the bed skirt, and an area rug add texture and help create an adorable, layered look. When it comes to guest bedrooms, comfort comes first. Do your best to create a quiet place, which offers privacy and light control and can make your overnight guests feel at home. De-clutter your guest room. Generally, keep to the idea that less is more, more space means a more comfortable room. Focus on including some must haves, such as a comfortable bed complemented by a quality mattress, cozy seating, some sort of storage/a chest of drawers can do the job/, a luggage rack, and adequate lighting/including a night light/. Note that a guest bedroom with two separate beds is definitely a more flexible solution. Consider adding some small touches that can make your guests feel truly welcome, such as a bottle of water, some snacks and basic toiletries, extra blankets, and chargers. 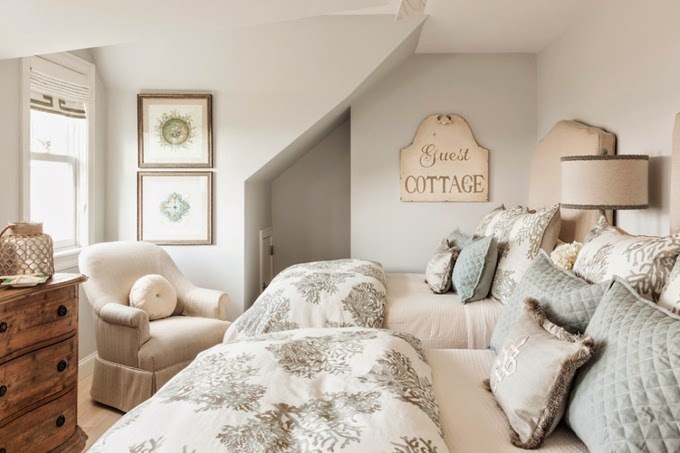 On a side note, transforming attics and basements into guest bedrooms complemented by bathrooms is a common, favorite solution, which adds to the functionality of any home. In the picture above, an inviting neutral guest bedroom. This room with a distinctive architectural character can definitely make your guests feel at home! Absolutely gorgeous! Unlike master bedrooms, which are an oasis of tranquility, comfort, and privacy, teen and kid rooms go far beyond a place to sleep in. Usually, they are multifunctional spaces, which, in addition to a zone for sleeping, accommodate also areas for relaxing, studying, playing, and entertaining with friends. These versatile rooms express the kids’ and teenagers’ personality and are their retreat from the outside world where rules and restrictions are too many. What parents shouldn’t do is try to impose their taste and ideas because, most likely, they totally differ from the vision their children have of a ‘cool bedroom’. As a rule, kid and teenage spaces exude energy, they are bold, vibrant, dynamic, brightly colored. Walls with wall decals, murals, graffiti, neon signs, and chalkboards are a favorite choice. Depending on their age, hanging beds and chairs, slides, swings, and climbing walls are also a common décor element. Although messy rooms are almost a rule, some easy storage solutions, such as baskets, open shelving, and storage benches and ottomans help to quickly tidy up the space. For shared rooms, bunk beds are a traditional option. In the picture above, a charming teenage girl’s bedroom. Pops of pink and yellow create a vibrant space, full of personality. A tufted headboard is a chic touch. A blue chandelier and a gallery wall add visual interest. Throw pillows and an area rug create a sense of coziness and add extra texture and color. 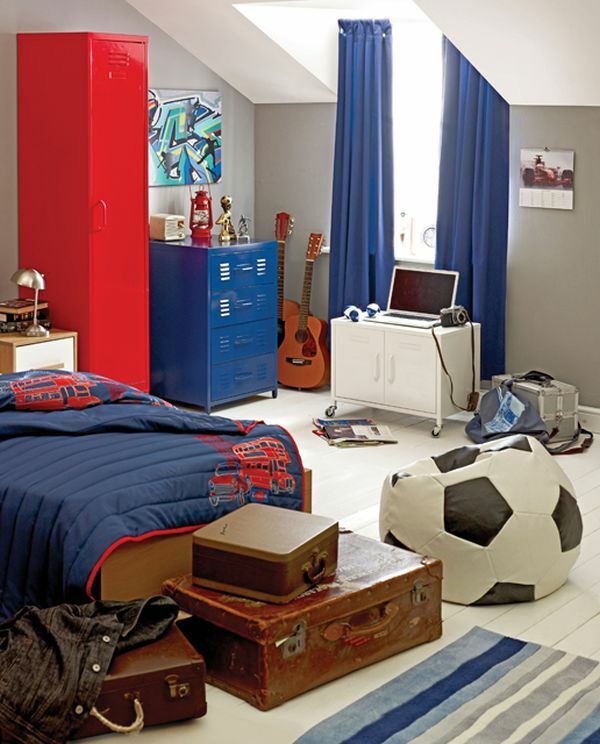 Above shown, an impressive teenage boy’s room with a distinctive architectural character. Bold pops of red and blue stand out against the neutral background. A mix of vintage and modern, this space offers functionality and has tons of personality. A football-like bean bag is definitely a make-a-statement décor item. Above, an awesome shared girls’ bedroom. This customized design offers adequate space to play and study as well as statement storage. Loft beds provide functional yet charming space to sleep. Bold patterns and vivid colors work well together against the neutral background of the walls and help create a dream-come-true retreat. In the picture above, another fabulous customized design, which offers adequate space to sleep, play, and study. Approached with creativity, this jungle-inspired room is all about functionality, comfort, and whimsy. Unquestionably, a magical space! When it comes to nurseries, these spaces should be planned to offer function and comfort for both the baby and parents. Whether in blue or pink or gender neutral, nurseries should provide cozy, adaptable modular furniture, which can be used for years to come. Cribs, dressers with changing tables, seating/sofas, daybeds, ottomans, and armchairs are favorite solutions/, easy storage options, lighting with dimmers, and mobiles are must-have décor elements. Wallpaper, throw pillows, bedding, upholstery, window treatment, and area rugs are ways to add bright pops of color, pattern, texture, and visual interest. Monograms/on the walls, pillows, or bedding/, framed letters, lit baby’s name, custom-made wall murals are options to add personality and beautify any nursery. Aim at creating a clutter-free nursery with adequate floor space for the baby to play. On a side note, always keep in mind that when it comes to nurseries, safety is a top priority. Generally, when decorating a nursery, focus on creating a space that can grow with the baby. In the picture above, a fascinating gender-neutral nursery. Adequate storage and a comfy rocking chair add functionality. Warm yellow walls, window treatment, and accessories, a colorful area rug, and a piece of wall art help create a space with a fresh, inviting look. Bedrooms go far beyond beds and bedding. When designed carefully, filled with pattern and texture, and embellished with eye-grabbing accents, they can become unique, dream-come-true personal retreats.